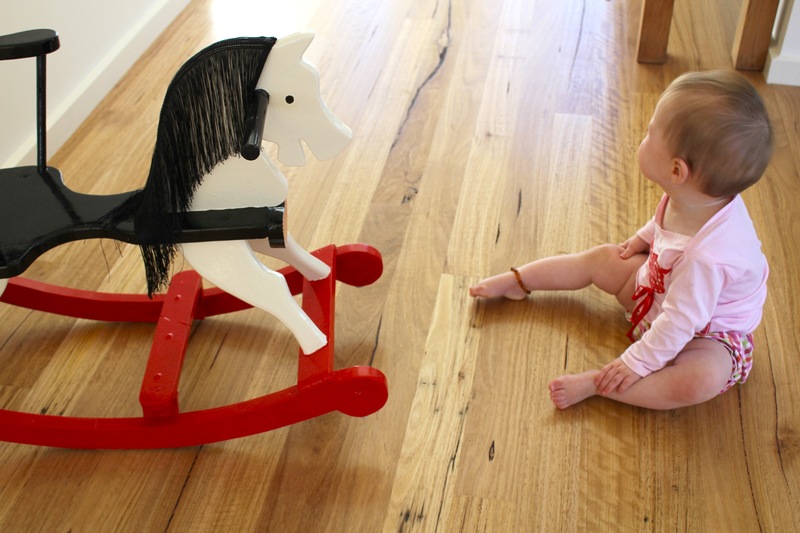 Rocking horse transformation (I need help with a name!) | Hey Bernice! I stumbled across Heidi’s Christmas present by accident last year. 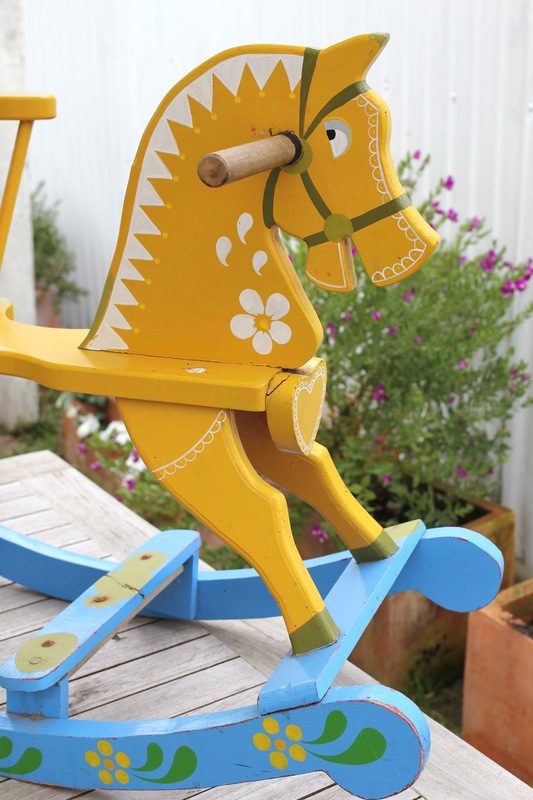 I was returning to one of my favourite places to waste a Sunday afternoon… The Mill Markets with the intention of buying an old wooden Pinocchio I had spied on my last visit (It was to become another addition to Heidi’s nursery wall). I didn’t buy it the first time because I wasn’t completely certain I liked it. So there I was staring at the Pinocchio, again… still not sure. I am usually a very quick decision maker, and seldom regret decisions I have made. So, whenever I’m not sure about something I should know by now to walk away. 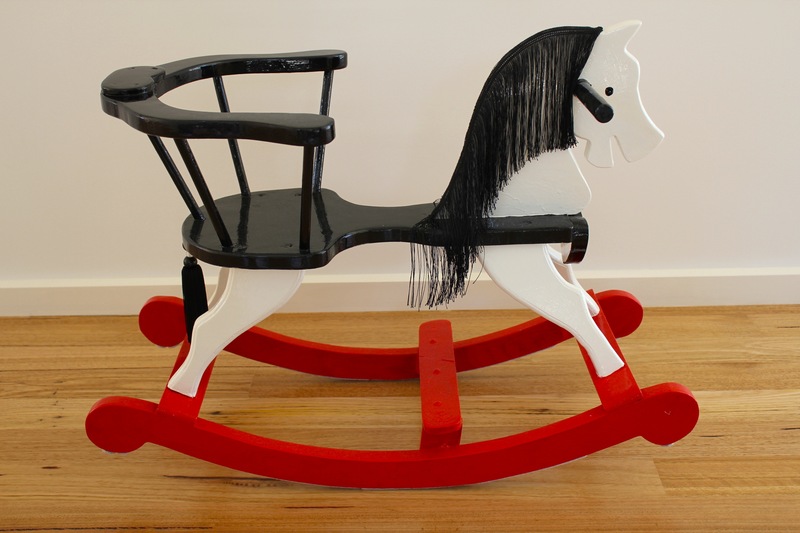 I did end up walking away, and thank goodness for that, or I wouldn’t have stumbled across this gorgeous old rocking horse, at a bargain price of $30! Many of you are probably thinking how gorgeous the paint-work is, and that it’s bright and fun for a little girl – which I did too. But I wasn’t sold, it needed a little TLC (Tender loving care – who knows what other meaning that could have these days in a teenager’s text message!). 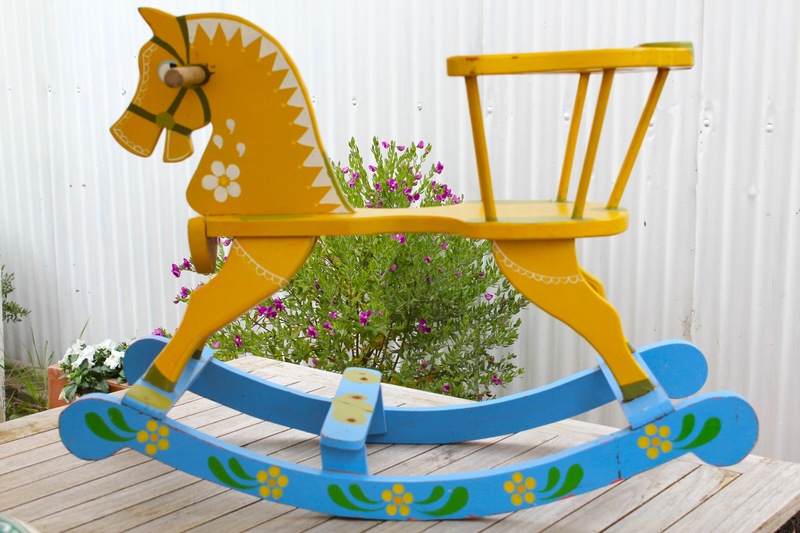 Secondly, my husband barracks for West Coast Eagles Aussie rules footy team (Blue and yellow), and I couldn’t have him thinking it was a West Coast rocking horse! My plan was to sand it back, and repaint it for Heidi’s Christmas present. I also wanted to add a mane and tail. With Heidi’s nursery having a touch of red, I wanted red to feature in the new colour scheme. I did a lot of searching online and Pinterest for inspiration, and pinned some options onto my Kids pinboard. 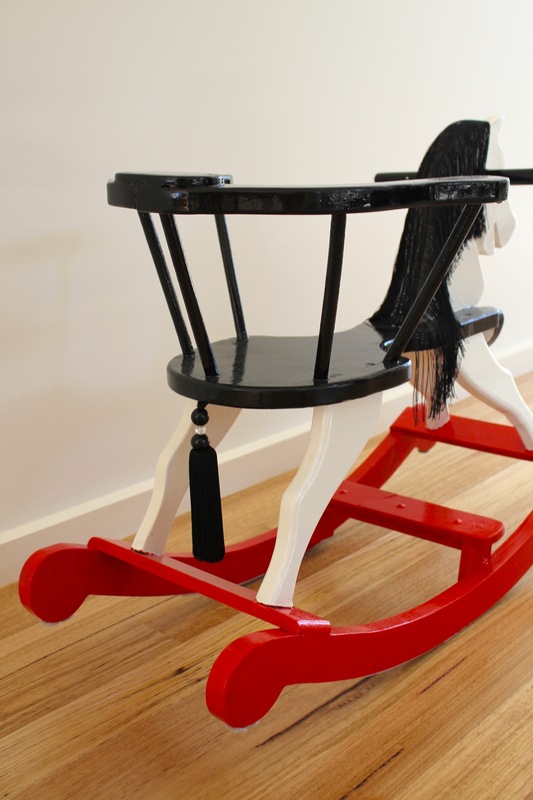 I decided on a white horse, black saddle/seat and red rocking apparatus (what do you call that part??). As much as I hate painting with enamel paint (it ends up all over me, then I have to wash down with mineral turpentine… and I can’t be bothered with the effort to wash the brushes either… Short answer – I’m Lazy!!!) I did use enamel for this project – it is a much better, shiny finish, and will ensure it survives the beating it is going to get over the years. 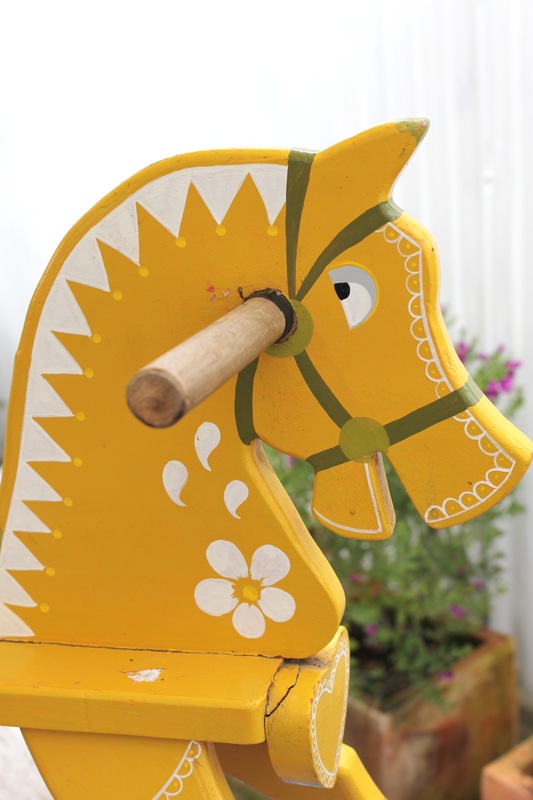 I gave the horse two coats of paint after a thorough sand-back, and wipe down with a damp cloth. I attached the mane with a staple gun. 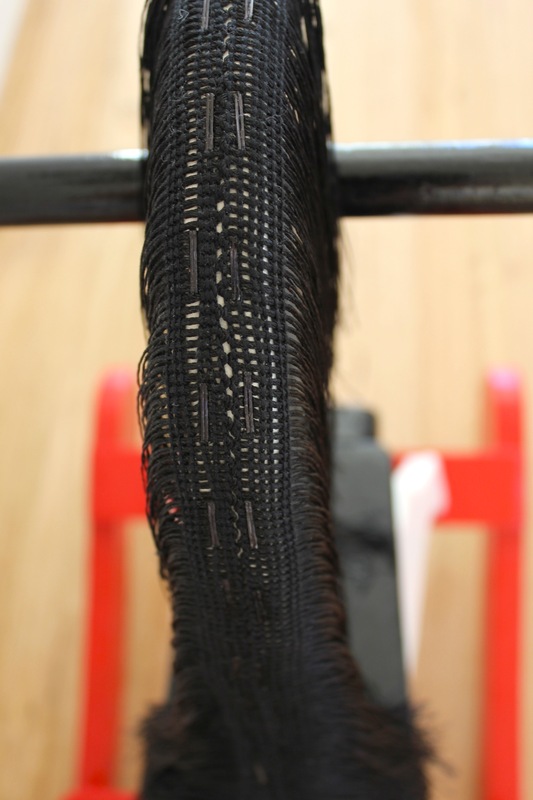 If you look closely below you can see the staples holding on the mane, that I then coloured black with a permanent marker. 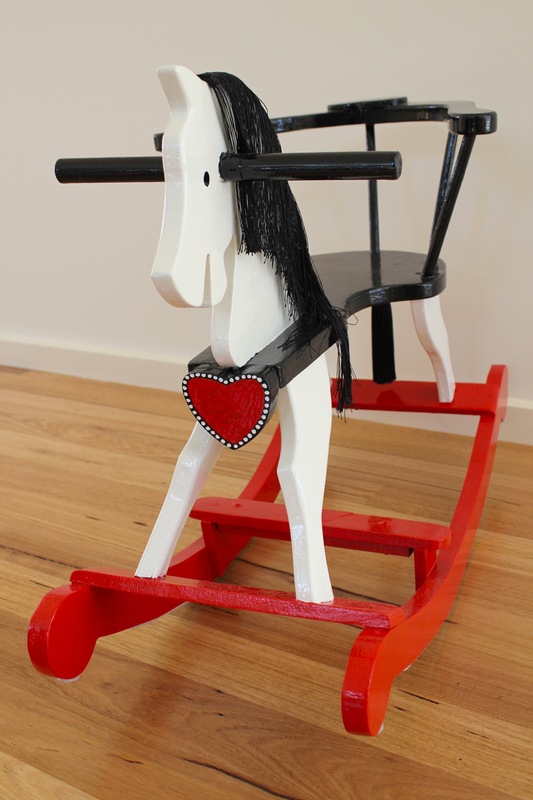 I added a little detail to the heart at the front of the rocking horse…. After all that effort, I would love to say Heidi was overjoyed to see her new animal friend… Hmmmmm – I’m sure she will grow to like it! Calling your help, I’m looking for a name for Heidi’s new horse… please send through your fun, quirky and imaginative name suggestions? Pingback: Heidi’s new nursery – ‘put a bird on it’ « Hey Bernice!